His restaurant is at the top of its game, yet on Friday the 23rd of October chef Kobe Desramaults announced that he'll be closing In De Wulf in December 2016. This news does not mean that he is retiring however. Desramaults on his decision: "I'm 35 years old and for 12 years I given everything for my restaurant; now it's time for reflection". Kobe Desramaults was 23 years old when he took over his parents' restaurant (then a French bistro) in his hometown Dranouter. Two years later In De Wulf was awarded a Michelin star, making Kobe one of the youngest chefs in Belgium to be honoured with the accolade. Kobe also owns two other establishments, bistro De Vitrine (opened in 2011) and bakery/sandwich shop De Superette (opened in 2014), both located in Ghent. 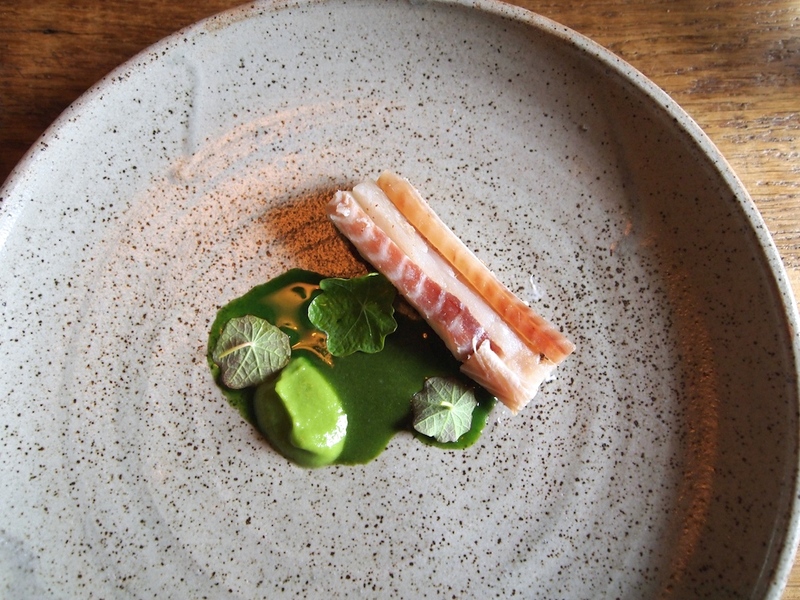 Unfortunately I was not there for the restaurant's whole 12-year ride; in fact my first visit to In De Wulf was in July 2013, when I enjoyed an outstanding meal that made me return to this magnificent farmhouse in the Flemish countryside early summer 2015. Last week I finally got around to finishing my review of this lunch, with the aim to publish it this weekend. You can imagine my surprise when news broke on Friday that In De Wulf would be closing next year. If you're thinking about going to In De Wulf just once (more) before the closure in December 2016, here's what you can expect. Lunch started with five appetisers. 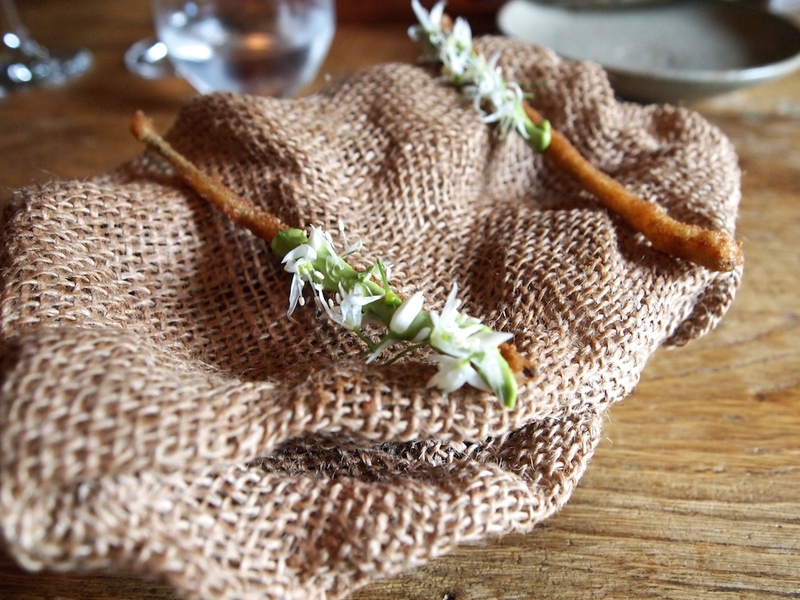 There was a delicious flash-grilled spring onion (coated with a thin and crisp batter), dipped in a thick and creamy ramson vinaigrette and coated with cabbage flowers. 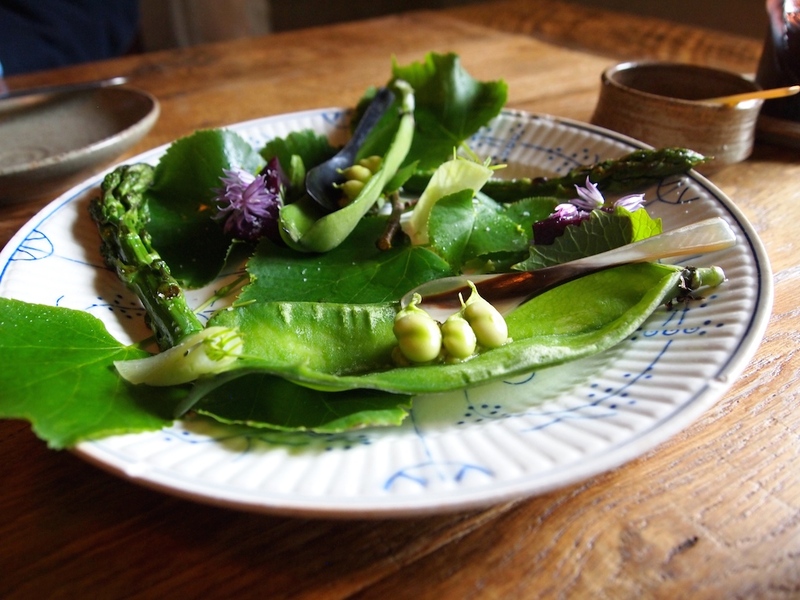 This was followed by "Mille Couleurs", a plate with fresh and crunchy vegetables, like young broad beans, grilled green asparagus, pickled kohlrabi with young spruce tops, and a Japanese style (nuka) dry-fremented beetroot, the latter having lovely sour-salty flavours and great crunch. 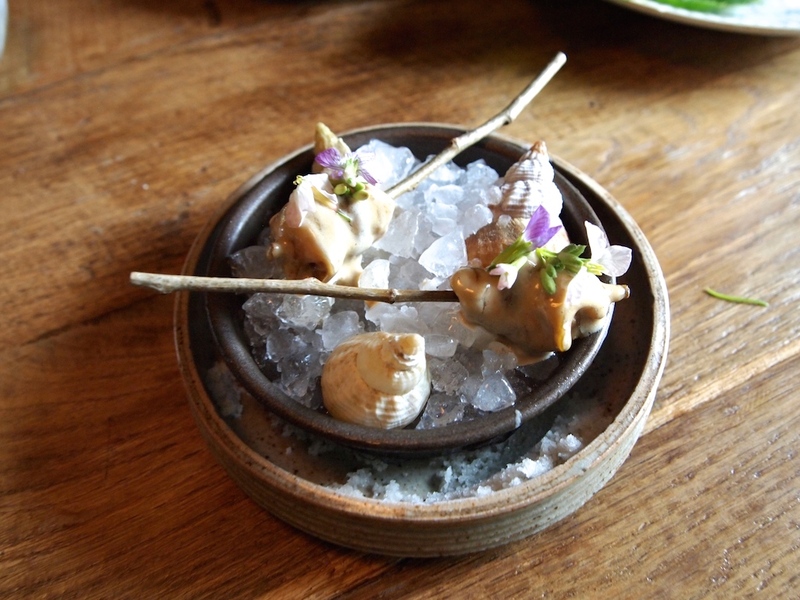 Next up was a superb whelk, served cold, and successively dipped in soy bean miso and a whelk mayo (made with whelk juices). 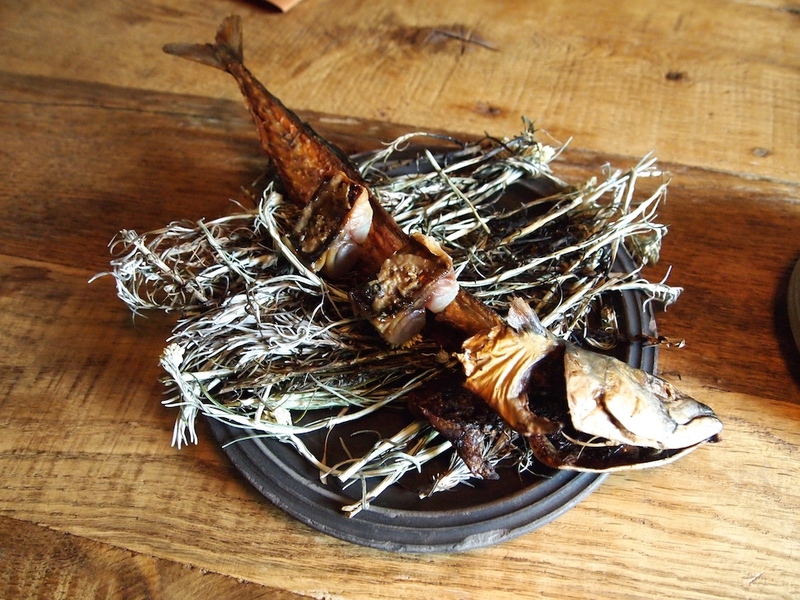 Then there was some wonderfully moist mackerel, flash-grilled skinside and then smoked over dried curry plant. 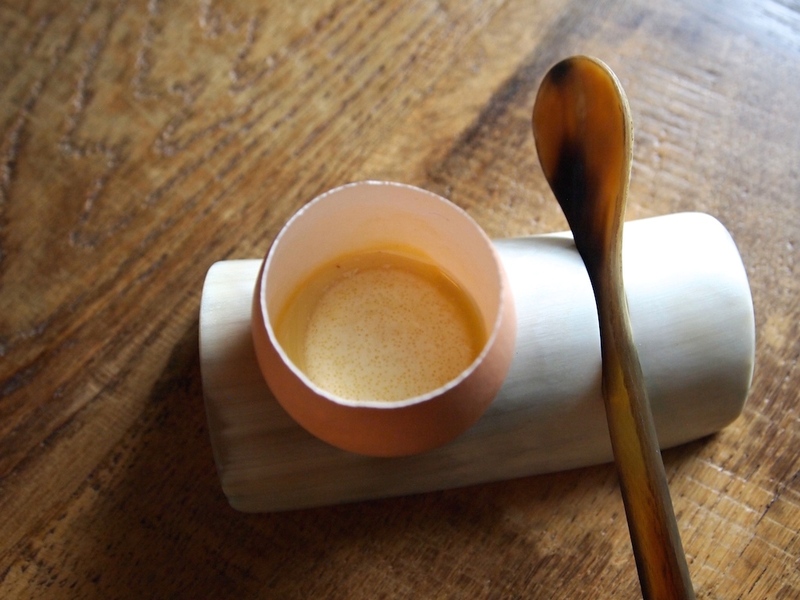 Best of all though, was an egg shell filled with egg custard, followed by shrimp miso, some turbot roe mixed with sour cream and finished with a few drops of hazelnut oil. Exquisite flavours, with a lovely creaminess from the custard and the sour cream delivered a nice sharp contrast. In de Wulf's sourdough (24 hour fermentation) was served next. 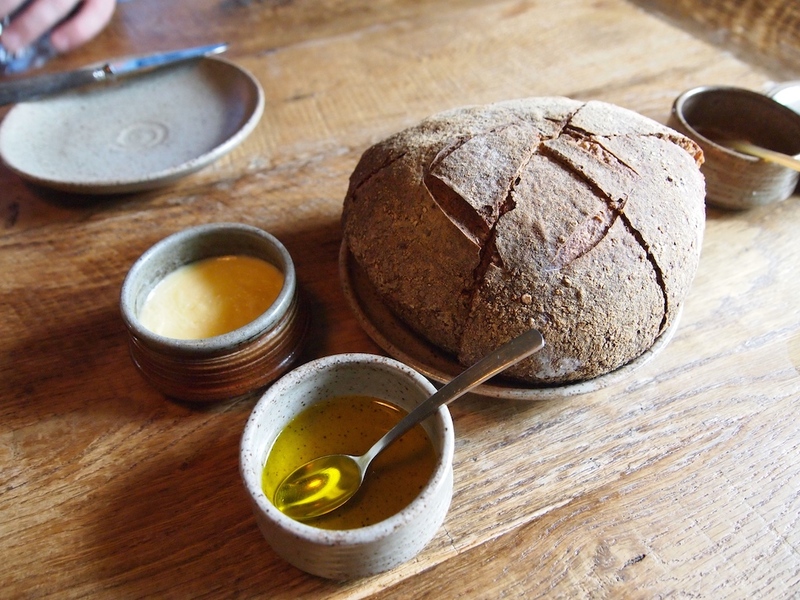 The sourdough is house-baked in a wood-fired oven, and served with homemade butter and first cold pressed rapeseed oil from Hof ter Vrijlegem in Asse (near Brussels). The first course of the tasting menu was dogfish with crème fraîche served on crisp rye toast, served with a green asparagus puree, a lovage-celeriac sauce and garnished with a few tubereous nasturium leaves. 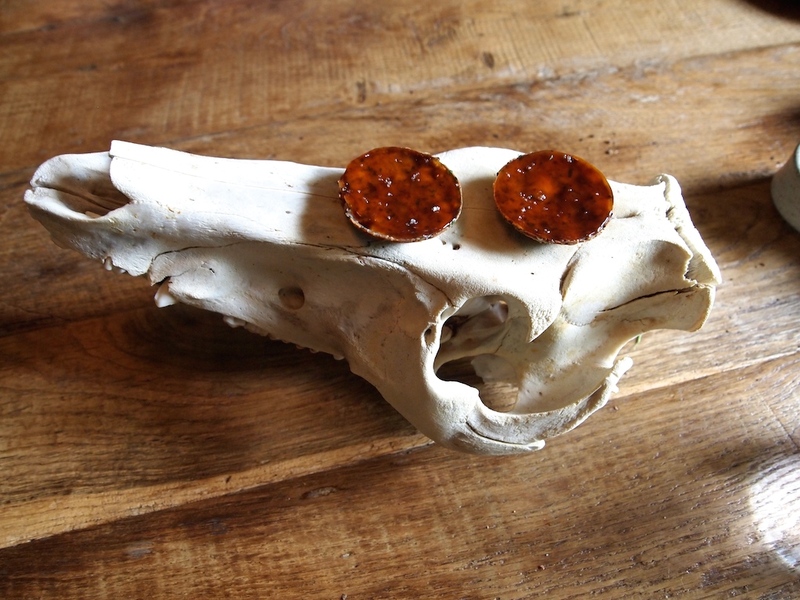 Excellent piece of off-raw dogfish with a wonderful soft texture, and the rye toast added flavour and crunch. 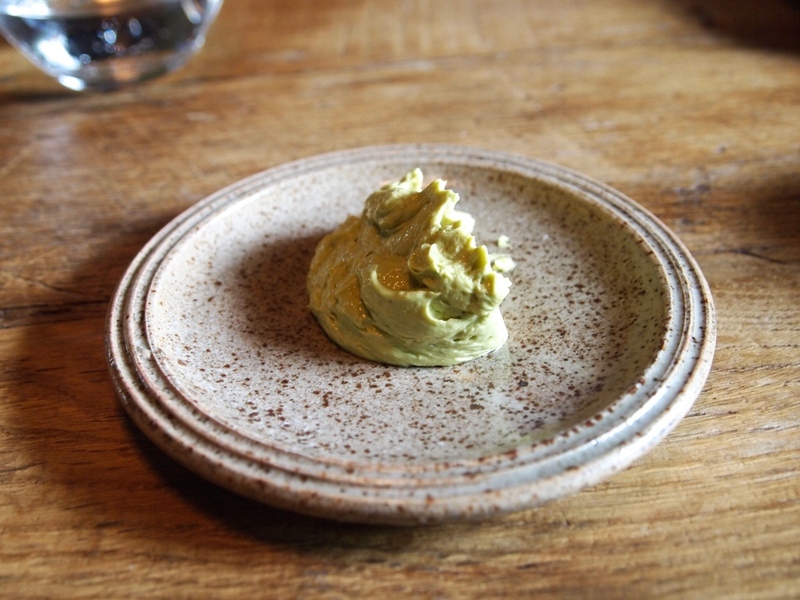 The asparagus puree, lightly seasoned with angelica, had beautiful clean, grassy flavours, but its smooth texture also made it nice and creamy. Loved the intensity of the lovage sauce, which complemented the dogfish perfectly. Second course was freshly picked Northsea crab, lightly dressed with yoghurt (?) 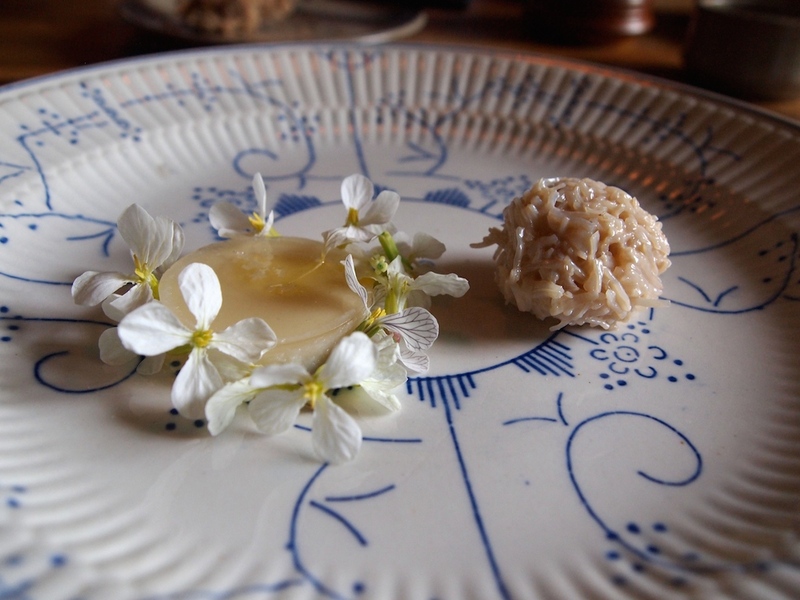 and accompanied by a cauliflower and rhubarb parfait, decorated with fragile white radish flowers. Well-made parfait with balanced flavours: first the tangy rhubarb hits you, quickly followed by the nutty and creamy cauliflower. 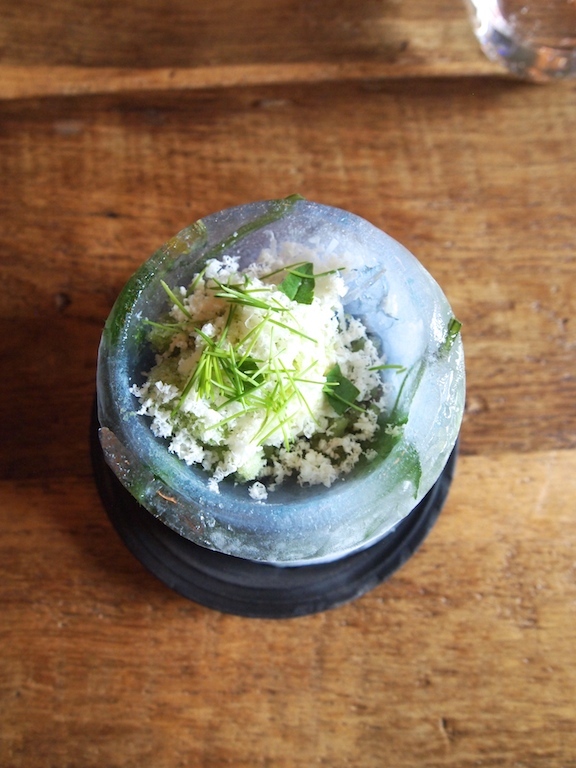 An elegantly presented dish with a fantastic interplay between the crab and the parfait. 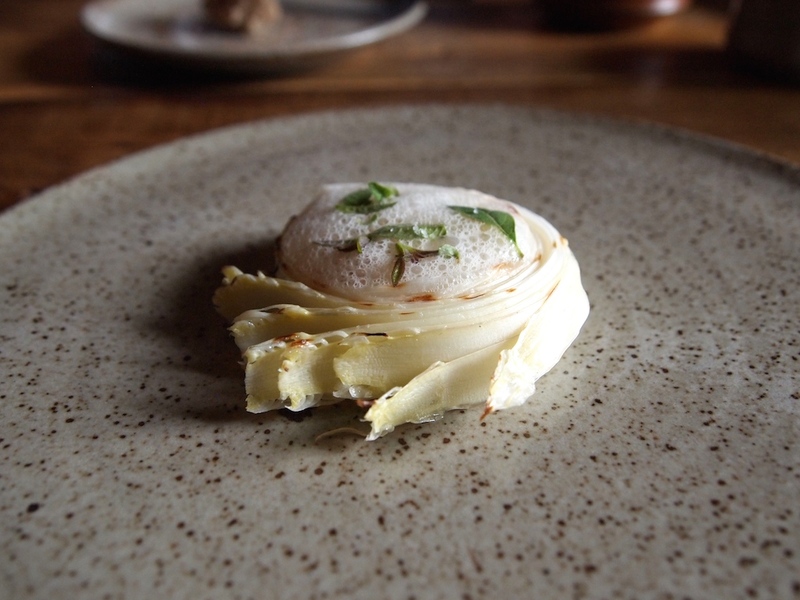 Equally successful was a ring of charcoal-grilled ribbons of white asparagus with a steamed and lightly smoked yolk in the middle, topped with a miso foam and finished with a Geuze reduction. Fabulous, bittersweet asparagus, the grilling adding a nice extra flavour dimension, and the creamy and soft yolk delivered a wonderful warm contrast, both in texture and flavour. On the menu at In De Wulf this afternoon there was also room for a simply poached lobster (from Audresselles, France), coated with a lobster head sauce enriched with butter, and finished with some coral powder. 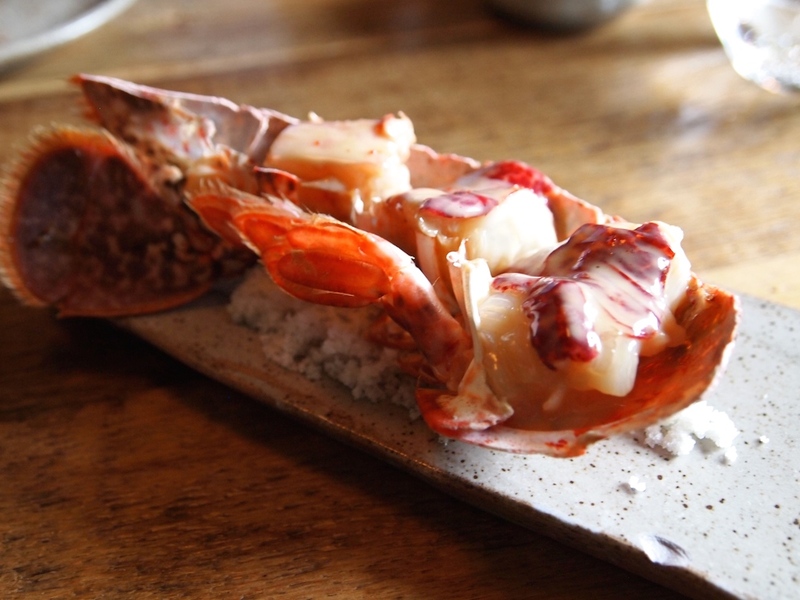 An outstandingly pure dish with exceptional lobster flavours, particularly the sauce which had great complexity. Fifth course was "Zurkelstoemp". Stoemp is a traditional Belgian dish of mashed/crushed potatoes mixed with vegetables, such as cabbage, Brussels' sprouts, carrot; The "Zurkel" part refers to sorrel. The three components of In De Wulf's Zurkelstoemp were served separately, and the idea was to mix them together yourself. 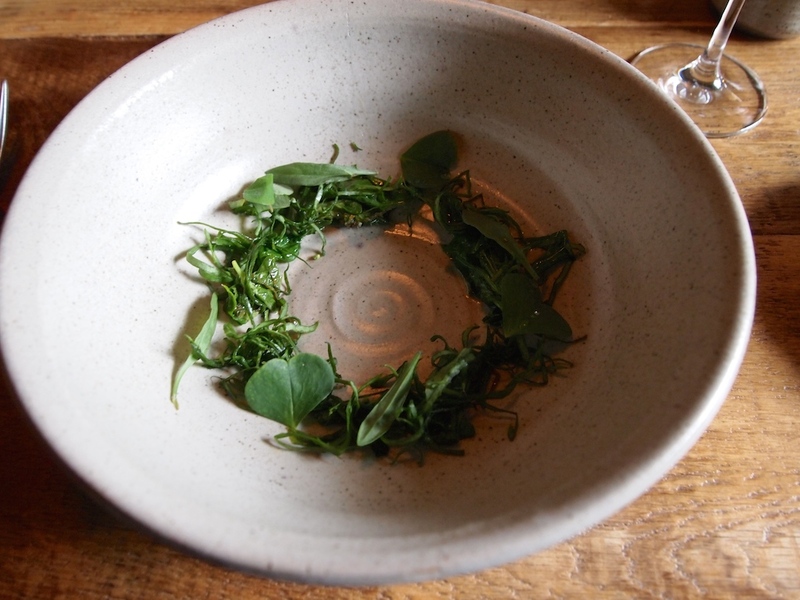 There was a plate with sorrel and wild spinach, some whipped hogweed butter and a salt crust baked potato. 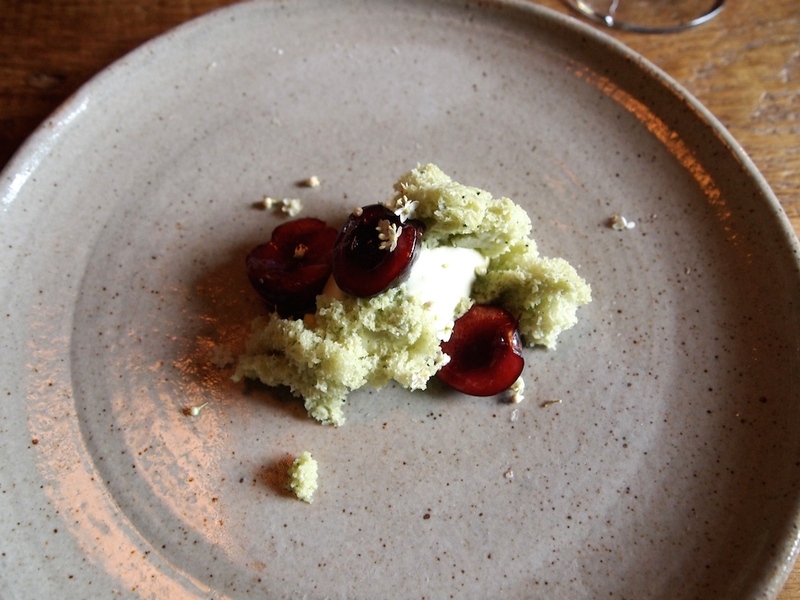 The outcome was a gorgeous flavour combination of warm and comforting flavours, with the sorrel and butter offering a lovely touch of sourness, each mouthful wonderfully satisfying. 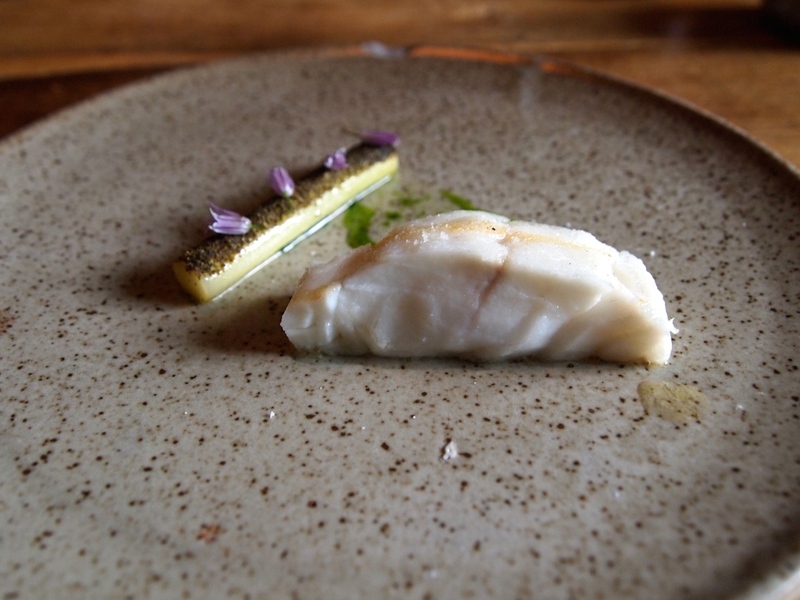 On to the sixth course, a marvellous piece of steaky turbot (first grilled, then finished in the oven), accompanied by overwintered leek (leek that has been kept in the ground over winter), covered with a green leek-top powder and garnished with chive flowers. The overwintering had given the leek a lovely earthy, less sharp flavour. Also on the plate was some aged preserved cucumber juice (aged for a year, then fermented with lactose), resulting in a terrific sauce with a great depth of flavour, as well as a hint of cucumber crispness. Next up were snails (from Comines), cooked in garlic butter for an hour, then briefly grilled and served on a skewer. 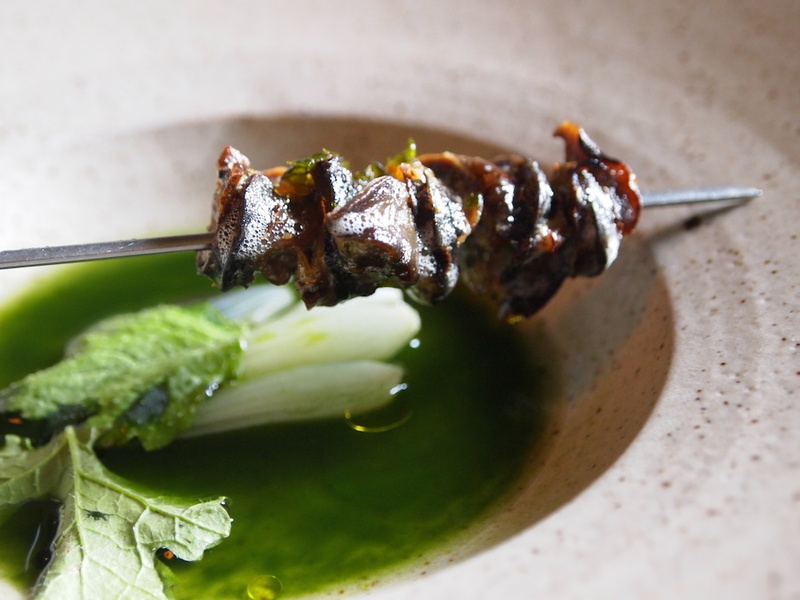 With the snails came a sharp ramson vinaigrette with spring onions and mustard leaves. 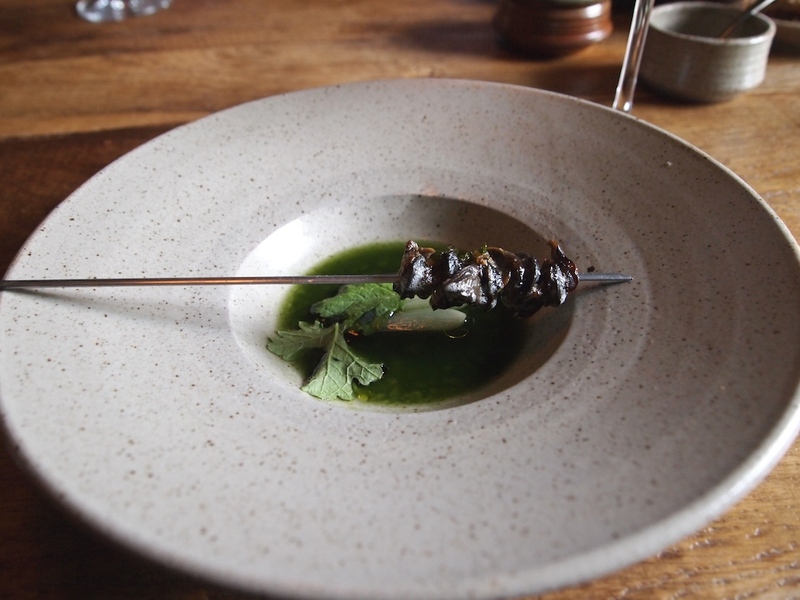 An inspired take on the snails-garlic-herbs combination, the snails being wonderfully tender and with a pleasant garlicky edge, and the pungent vinaigrette delivered a nice brisk contrast. 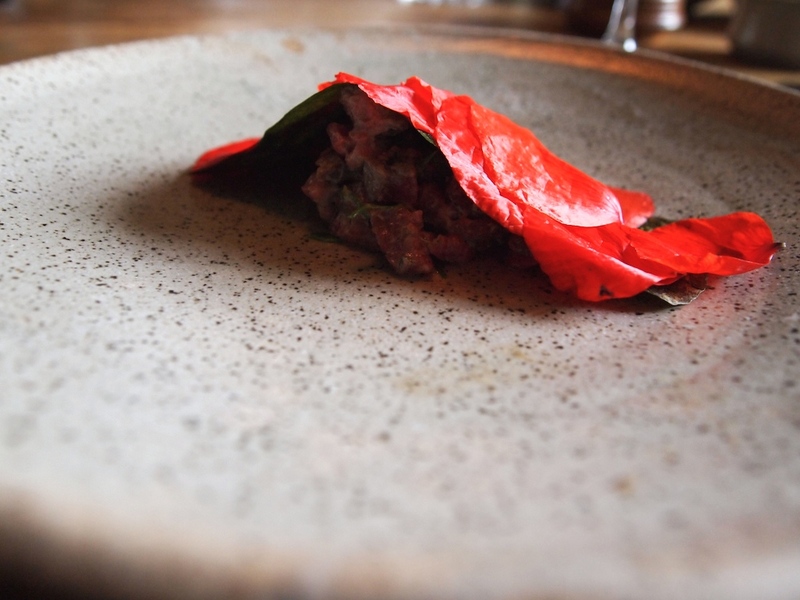 Eighth course was roughly cut Holstein beef tartare covered with a raw chard leaf and perfectly arranged poppy petals. 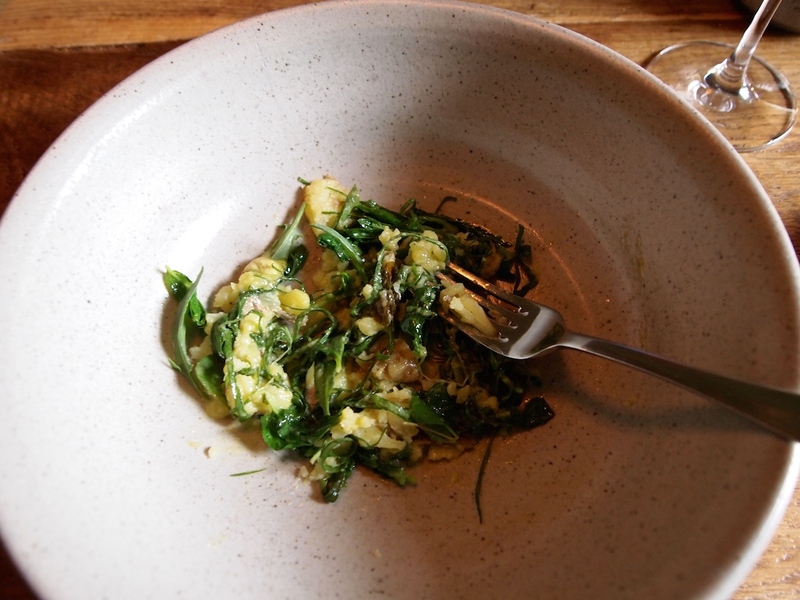 The tartare had been deliciously seasoned with miso, chard, and blackthorn (sloe), an imaginative choice of seasoning. But it wasn't just the seasoning that left a lasting impression. In De Wulf is located in Dranouter, near Ypres, an area were some of the bloodiest battles took place during the Great War (WW1). 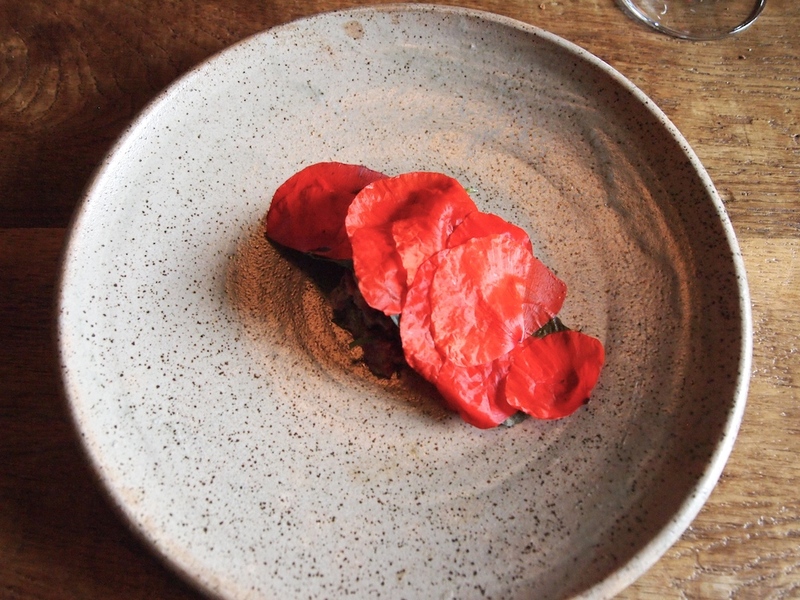 Poppies have become the symbol of remembrance of soldiers who have died during wartime and the use of poppy petals in this dish is an incredibly thoughtful and moving touch. Lunch continued with a crisp flax seed cup with a soft filling of pork cheeks, neck and brains, covered with a thin layer of pork jelly. 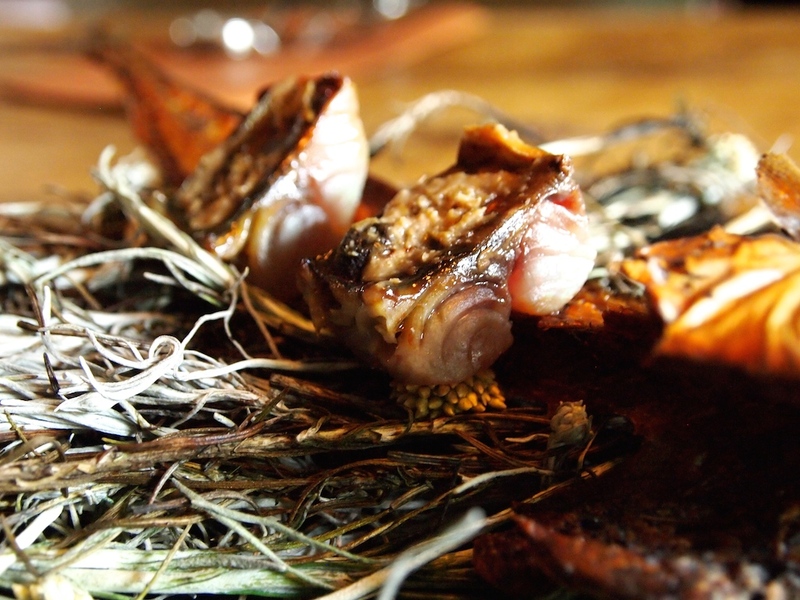 A fantastic bite with real powerhouse pork flavours. 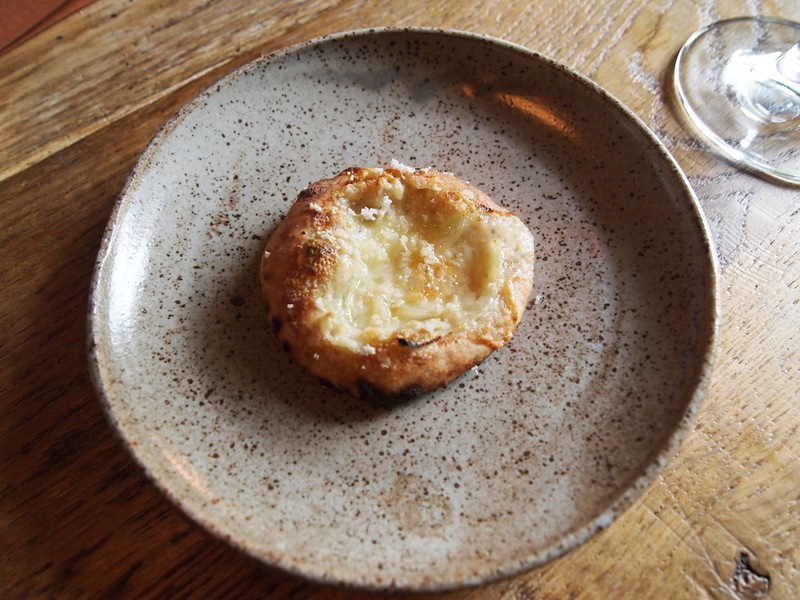 Some delicious house-baked flatbread followed, topped here with a sharp goat's cheese, onions and horseradish. 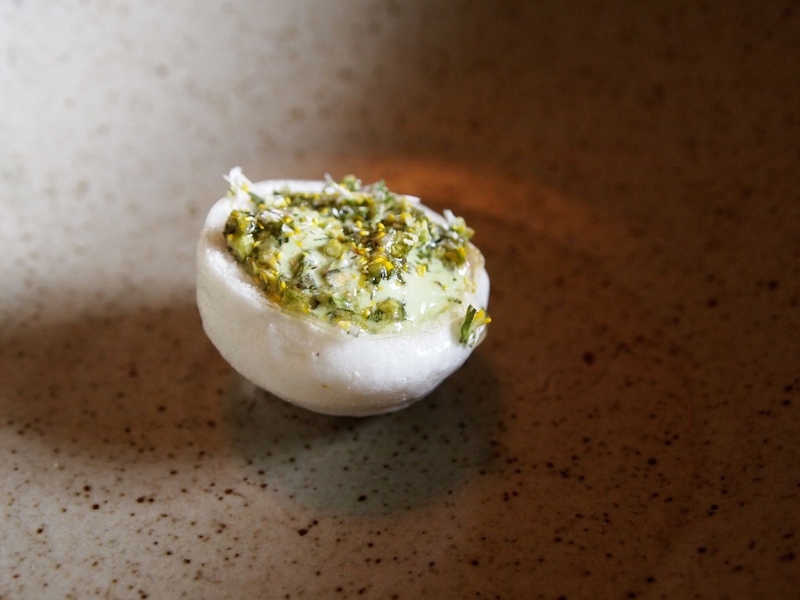 The next course was a light and refreshing cheese course of goat's curd, young spruce tops and verbena. This was shortly after followed by a lovely dessert of mountain ash ice cream, pumpkin seed ice and plump and juicy halved cherries. Second dessert was a meringue shell filled with rhubarb compote, sorrel ice cream and pineapple vinaigrette; a delightful combination with just the right balance between sweetness and tartness. The real showstopper, however, was a superb hazelnut mille-feuille. 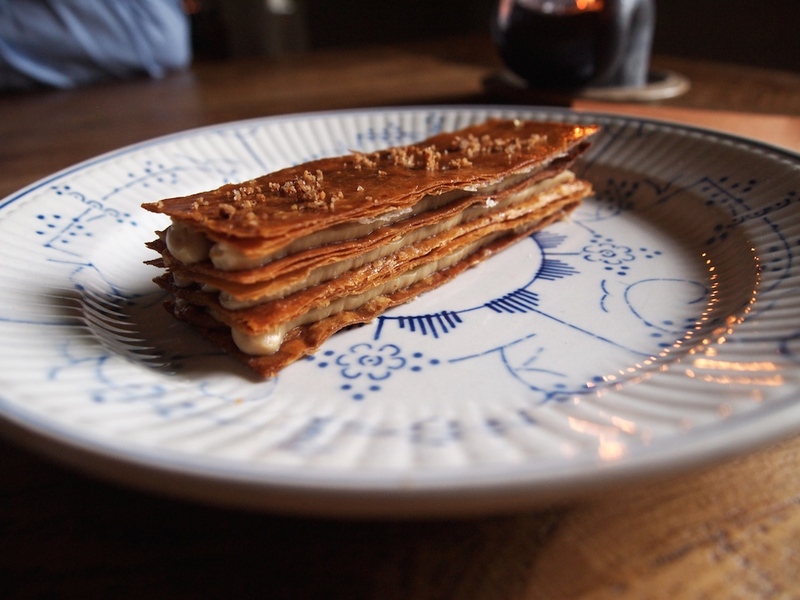 Sublime pastry cream flavoured with hazelnut, créme fraîche and chicory, sandwiched between layers of fabulously crisp and darkly caramelised pastry (made with smoked butter). 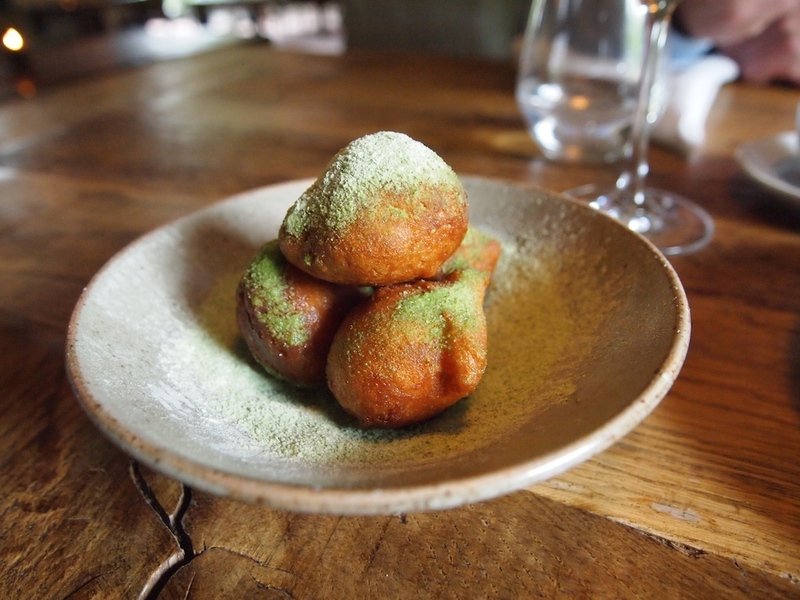 Oliebollen (the Belgian/Dutch answer to doughnuts) sprinkled with meadowsweet powder. 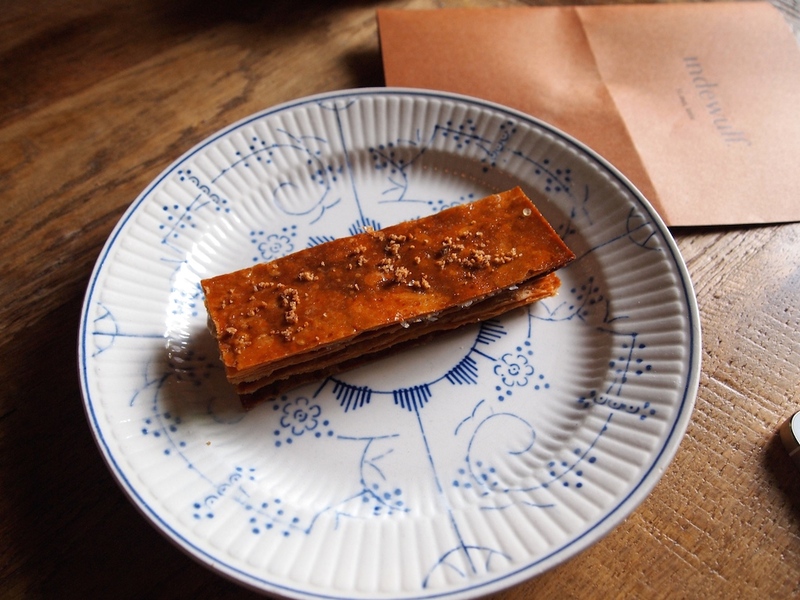 For a number of years now, In De Wulf has been a popular destination restaurant and in 2014 they were at number 61 in the top 100 of the World's 50 Best Restaurants list. In the 2015 edition In De Wulf was, bizarrely, no longer on the list. The World's 50 Best list is famously know for the rises and falls of restaurants, but who knew that the voters of the list would lose their excitement about this restaurant so quickly. Anyway - I certainly did not loose my interest or excitement. 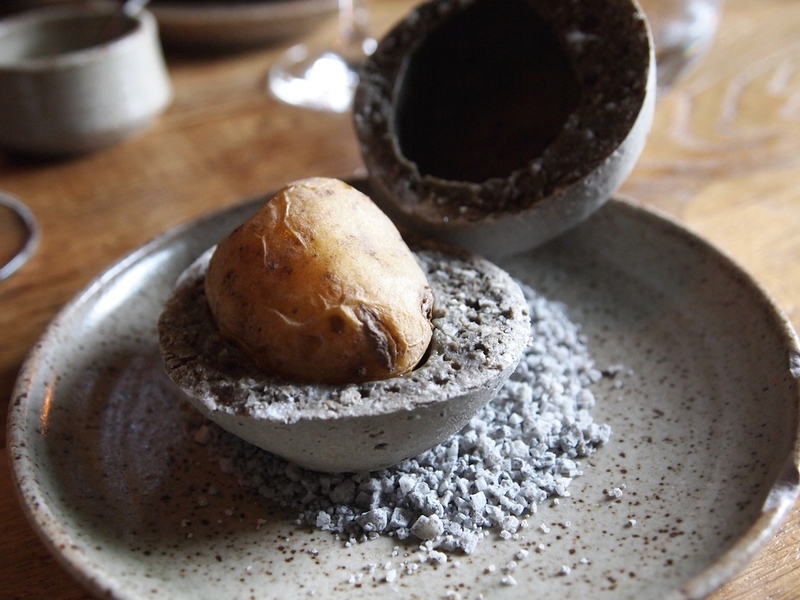 At In De Wulf they know exactly what they're doing and their cooking is exemplary for this type of cuisine. I was presented with a series of beautifully looking and perfectly executed dishes. Dishes which are creative and original, with just a few ingredients used to great effect. But above all I like how Kobe Desramaults blends the traditional with the out of the box; in the stoemp, the snail dish and the beef tartare in particular, this was marvellously done. I am sad that In De Wulf will close at the end of next year, but I can understand why Kobe Desramaults feels that the time is right for a new project, now that he is at an age which combines energy and experience. I can't wait for the sequel, but in the meantime do go to In De Wulf. Gather ye rosebuds while ye may!